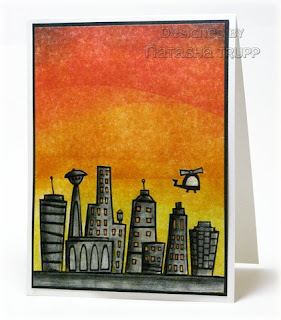 As soon as I saw this skyline image from one of the Doodle Factory releases, I knew I had to make a sunset skyline card. Taking some tips from Michelle Zindorf , I decided to get out the brayer, some clear embossing powder, some pencil crayons, and some ink pads. Then I got to work. I stamped the image, then coloured it in with Prismacolor pencil crayons. I only used a black pencil crayon for the buildings and an orange pencil crayon for the windows. After that was done, I covered the entire image with a versamarker and embossed it with clear powder. Then I chose my colours for the sky. I started with Summer Sun, then Pumpkin Pie, Ruby Red, and just a touch of Not Quite Navy. I framed the image on black cardstock, and placed that on a white card base. I liked it too much to add anything else to it. I really like how it turned out! I'm not sure when birthday banners became super popular, but you've got to admit, they are totally adorable! This card is for one of my cousins. He's got a great sense of humour, but he's a tad goth. You know, dark hair, dark clothes, several piercings, that sort of thing. So my idea of a funny card for him, is this ray of sunshine. I used teal and orange, and cheerful stars, and a very sentimental greeting inside. I'm sure it'll make him laugh, but he'll still appreciate the fact that I made it for him. I have been feeling quite uninspired lately. I know the main reason was that my studio space (as I like to call it) was a complete disaster. Today I finally set about finding the table surface, and the floor, and some other organizational things. After that, I still didn't quite feel like being creative. So I went over to SCS to browse the forums. I came across this thread about the clean and simple style that still packs that wow punch. That has been the style that I ultimately lean towards the most. Finally, after that quick read, I sat down and just did whatever came first. I started with the star image from PaperTrey's Text Boxed. 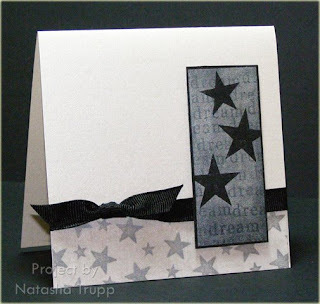 I stamped that with Moonlight White on black cardstock. Next, I brushed some white Pearl Ex powder over the image. Then, I inked up the "dream" stamp with versamark and stamped that all over the image. It's neat because it gives it the illusion of the kiss technique, except it's not backwards! For my patterned paper, I just stamped the two star images in that set all over the place, coated the whole paper with versamark, brushed more white pearl ex over it, and added it to the card base. I think it's finally safe to post this card. It's for my brother, I was just being a bratty little sister by making his card have a dinosaur on it. Really, 30 isn't old, but it's one of those milestones people make a big deal over. So dinosaur birthday it was! Some card details- I stamped the t-rex, then went over it with a versamarker, clear embossed it, then coloured in the sky with a Copic marker. Next, I drew a little earth for the t-rex to stand on. The sun is part of a circle punch out. The mustard piece has Linen stamped on it and the olive background has splatter backgrounds and sponging all around the edges for that extra "aged" look. I cannot wait for the irises in my garden to start blooming. It's still about a month away, but in the meantime, I have this beautiful set, Siberian Iris by Flourishes, to satisfy that spring craving. The purple and yellow ones are my favorites, so that's what I made this one. 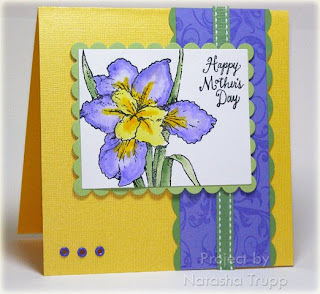 I used Stampin' Up markers, as well as reinkers and an aquabrush to colour the iris. The card base is made from some Bazzill Bling cardstock, I also spritzed the main image panel with some white shimmer spray to bring in more shine. The card measures 5.5 square. I needed a break from all those anniversary cards, then I remembered that it's a very good friend's birthday coming up soon. I found this cut piece of Scenic Route paper on my desk, so that served as inspiration enough for me. 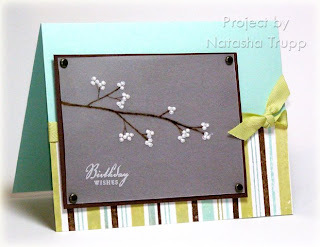 I made a teal card base, attached the pattern paper, then tied on the ribbon. I did this first (for once) because usually I end up making my image panel way too wide, and the ribbon ends up covering most of the image. So I figured out where the knot would go, then cut a panel to size. Once I had the panel, I then figured out what I was going to put on it. This cake from Piece of Cake fit quite nicely. Plus, with all the accessories you can add to it, I could bring in all of the colours from the pattern paper (plus orange, you can't have candles without orange or yellow!). Another anniversary?? 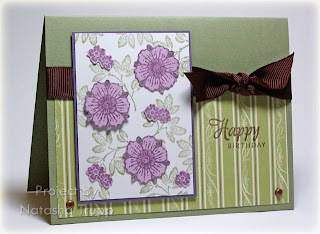 This is one of the cards that I deemed "not fancy enough" for a 50th or 60th anniversary. I guess I'll just keep it in my card stash for some other anniversary. There certainly are several from May through September. For this one, I started out with a shimmery white panel, stamped the branch on there, then the flowers, and I filled in the leaves afterwards. 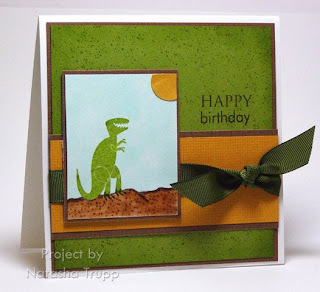 The striped paper is from a Simply Scrappin' kit a few catalogs back. I love all striped pattern paper (as I've said countless times before) so I was happy to use some here. The ribbon is also from a few catalogs back, but I still have at least 10 yards of it. Might as well use it, especially when it coordinates so nicely! I know, it's spring, but whenever I use this set, I can't help but use autumn colours. This is for another anniversary, so I really wanted to bring in some gold into the design. For the leaves, I coloured them with markers, spritzed them, then stamped them all over. Then I outlined a few of the leaf stamps with gold and just stamped that all over. Next, I added in some gold edges and gold splatters. Finally, I spritzed the whole thing with a gold shimmer spray. That wasn't enough gold though, so I brought in a few brads, some gold cord, and gold embossing powder for the greeting. Do you like Doodle Factory? 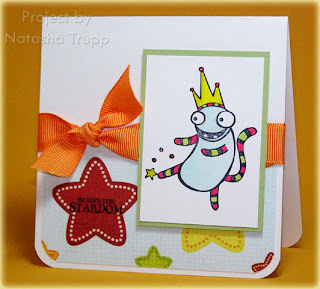 I am loving all these new releases lately by Doodle Factory through Starving Artistamps. Check out the latest one here. Plus you have until Monday to leave a comment there, giving your favorite Doodle Factory character! Check those out here if you don't yet have any. In honour of this celebration I thought I'd make a card using one of my favorite Doodle Factory characters. This one is Twinkx, and as the sentiment says, he's headed for stardom! The paper is by Maya Road, and that sentiment is from Verve Visual. 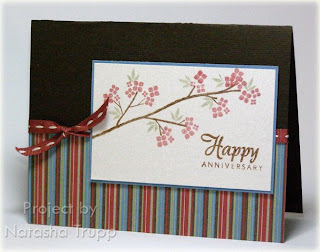 Over the next few weeks I have several anniversary cards to make, and they're not for small anniversaries either. 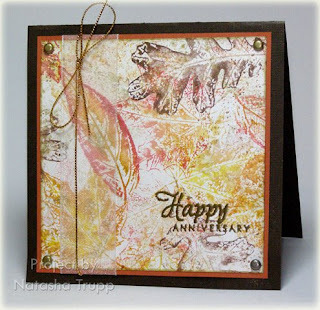 I have to make 2 cards for a 50th, and 2 or 3 more for 60th anniversaries. My dilemma is that these numbers are usually associated with specific themes and a specific style. I was trying a few different things out, but they just don't seem right for that age group. This is the third anniversary card I've made in 2 days, and I think I'll finally be able to use it for one of the upcoming events. I looked up the gem/metal for 60th anniversaries, it's a diamond jubilee. You know how hard it is to showcase diamonds on a card? 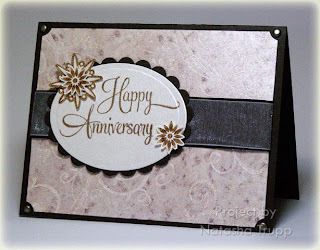 I started with a shimmery white base, then I embossed some swirls on it with Pearly Sparkle EP. That really wasn't that strong of a look, so I needed to add in some other colour. The shimmer paper has a slight gloss so I thought I'd try some polished stone on it. I mixed gold, silver, and chocolate reinkers, and smeared it around. It ended up looking very much like marble. I wiped off the excess ink from the embossed parts. Finally, the swirls really stood out! The rest of the card was quite straight forward. I used nestabilities for the ovals. The floral images are made up of layered images from Baroque Motifs. The greeting comes from Kitchen Sink's 3-step roses. This evening I saw that Kristina had posted her colour challenge, with an end date of Thursday. I had to get cracking on my card then! I'm pretty sure I've used this colour combination, or at least something quite similar to it before, but that doesn't mean it's not worth revisiting! I picked up a pack of white textured cardstock today. It is simply stunning to use as a card base! I got a pack of 25 for 4.75. It's by World Win Papers, I believe. I got all the colours out for the challenge, and set about sketching a design. I decided Saffron flowers with Cocoa centers would be nice. I brought in the blue and the celery as background accent pieces. I also applied crystal effects to the flower centers to give the look of those round epoxy stickers. This was a card that I sketched out at work today. 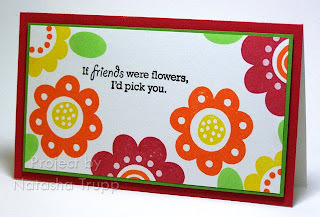 Originally I had included a third side tab, but I really wanted it to say "friend" or "to you" and I didn't have any stamps in the same font, so two tabs it was. This one was inspired by the pattern paper, it's by My Mind's Eye, and is called Sundance "The Best of Friends" Flowers/Orange. I was inspired by the colours and flower shapes in the paper. I wanted to add a bit of green, but none of the inks I had really worked. Instead, I went with River Rock, which is kind of sandy coloured with green tones. I was pleased with the result. I really like coming up with new-to-me colour combinations. For the tabs, I cut a strip of the pattern paper (the orange is the reverse design). For the tabs, since they were going to up so high on the one side, I applied tape to the high side, and a pop dot to the other to compensate and even them out. I was really inspired by this colour combo, and I would LOVE to see your take on it. Who knows, there may even be a prize?? I know it's quite early, but hey, when inspiration hits, you might as well see where it takes you. I started by inking up the large leaf stamp with 4 different craft spots. I stamped that on some confetti white paper, and also stamped the outline stamp around it. I have become re-obsessed with kraft paper, and how craft inks look on them, so I used that as my cardbase. I stamped the small leaf using the 4 craft spots I had used on the large leaf. A father's day sentiment seemed the most appropriate, so I went with that. I added on some black ribbon to divide the stamped section from the unstamped, and that was that. 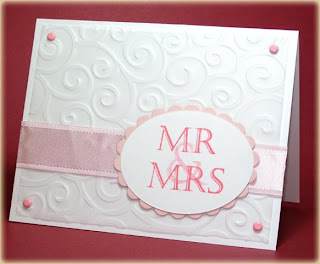 This card could really be used for a few occasions- birthday or wedding. I had stamped the cake a few days ago and just left it there. I finally came back to it and saw that it needed some floral embellishment, maybe some leaves, and of course a sentiment. The little flower is a Maya Road velvet blossom with a brad in the center. I cut out those tiny leaves and carefully attached them under the flower. The ribbon is some I bought a while back at Gail's Wholesale. You really never know what you can find there! 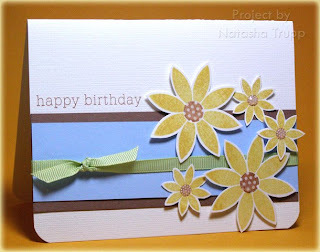 I don't know if I've ever done the ribbon knot with the slit punch decoration on a card, so I decided to try that. Every week I see Julee's awesome sketches, but I rarely remember to try them out. Earlier this week, I doodled the sketch onto a post-it note and stuck in on my craft table so I wouldn't forget this week! Unfortunately the try details of this card are best seen in person. I watercoloured the flower and leaves with twinkling h2os. I went with a messier style of watercolouring because I wanted a soft look. It went with the kraft paper that I lightly edged with white ink, as well as with the soft vellum layer. The yellow strip of paper is some Bazzill Bling cardstock. I didn't have enough shimmer, so I needed that extra bit more. Accessories, etc. : paper piercer and guide, twinkling h2os, pop dots, small oval punch, eyelets. 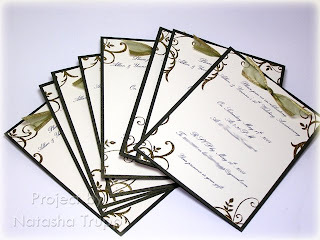 Here's another simple and elegant creation using the Flourishes new set, Wedding Essentials. 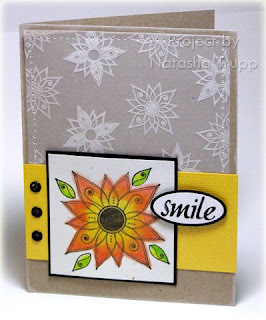 For this one, I started with the fancy divider from Many Sentiments. I placed the wedding sentiment and the pair of rings between the dividers. 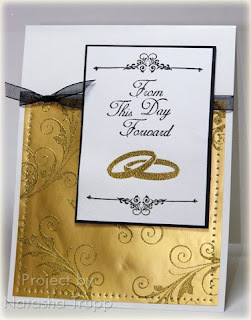 I used the flourish from the wedding set to make my gold background paper that little bit more special. 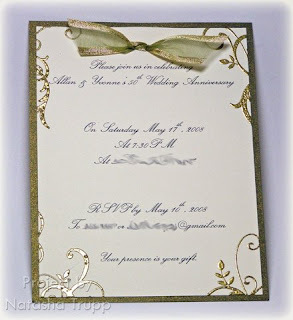 I embossed the flourishes so they would really stand out on the gold paper. Even though black isn't really a colour associated much with weddings, when it's used as an accent colour, it can really make the whole design "pop". Paper piecing is a technique I rarely do. I think it's because I am more attracted to using bolder images. However, this new set, Wedding Party, by Flourishes is great for paper piecing! I stamped the bride onto two pieces of white paper. I coloured in the hair, skin, and flowers on the the one piece. On the other, I inked up the Damask background with versamark, stamped it over the dress, then embossed it with pearly sparkle embossing powder. I cut that out and pasted it onto the fist image. For the flowers and veil, I added in some stickles to really make them sparkle. The background on the pomegranate is the Damask stamp again, and the word Love comes from Flourished Words. Remember, check out the SCS member forum here for some contest fun! Simple elegance- this is a style I truly love. 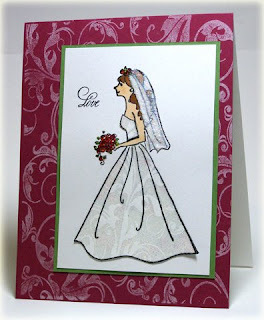 This latest Flourishes set, Wedding Essentials, is perfect for this style of card. 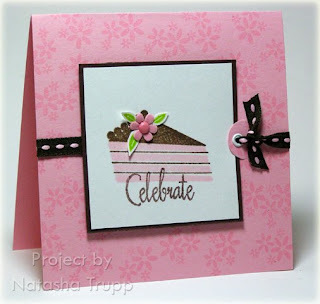 I cuttlebugged the swirl background onto vellum, attached that to my card base with pink brads, then put the focus of the card on the Mr & Mrs stamps. I used an oval nest to cut that out, mounted it on some pink paper and added in some luscious pink satin ribbon. It was a snap to put together, but still so elegant. Be sure to check out all the new releases here and check out some contest fun here. It's my grandparents' 50th anniversary this year and we're throwing them a small family get-together. I made these simple postcard style invitations for the event. 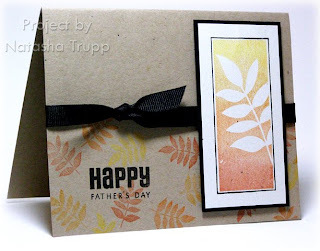 The shimmery paper is by Prism- it's called Rusted. It's a really interesting Green Gold colour. I printed the invitations out on Very Vanilla cardstock. The font is Exmouth (a freebie from dafont.com if you're interested). The swirls along the sides of the vanilla are from Baroque Motifs. I embossed them with gold powder. The ribbon is something I found at a local scrapbook store. It matches the paper quite nicely. To do the knots, I used the double hole punch and did the sneaky knot. I did this instead of tying the actual knots because it ends up being a lot flatter and thus more mail friendly. 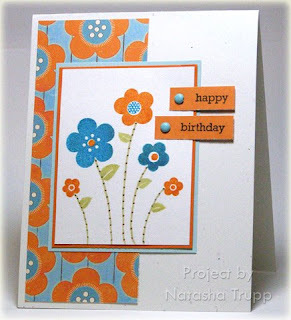 Here's another quick-ish card featuring some of my latest PTI stamps. I started by stamping the branch from Out on a Limb onto some vellum. Then I stamped the little dots in Brilliance white. That wasn't quite shimmery enough, so I added liquid pearls over the dots. I am loving the new colours, and wanted some matching designer paper with the aqua and moss colours (I didn't purchase last month's 6x6 paper pad). Then I recalled that I had the faux ribbon set. I got that set for the greetings and have barely used the "ribbon" part of the set. Well, I decided to make my own lovely striped paper then. It worked really nicely! I am pretty obsessed with having matching striped paper with the ink colours I have, and this is a much cheaper alternative that for some reason, just didn't cross my mine before. On another note, has anyone else noticed the extreme lack of chocolate brown or white brads?? Seriously, I am obsessed with finding some reasonably priced ones. I had to use brass ones on this card, but I would've preferred chocolate ones. What better use for my new ribbon and paper than this fall-to layout? I LOVE using striped paper on this layout, then using ribbon as the seam between the main image and the pattern. I have to say I was pleasantly surprised at how well the satin ribbon knotted! It's exceptional quality! The card is really simple, but I am really loving it! I think I may make a whole lot of this style to have on hand. There's not many designs that I am keen on replicating, but this is definitely one I would consider making at least 10 more of! Here's a vibrant card for this late evening. I meant to upload it earlier. I know I've done similar layouts and styles, but it's a keeper kind of design. I love the vibrant colours sounding the bold black sentiment. I received a whole lot of new PaperTrey stuff, so I foresee a PTI stamping binge tomorrow or Sunday. I picked up two of the new sets, all the new colours, as well as some older sets. I cannot wait to get started. 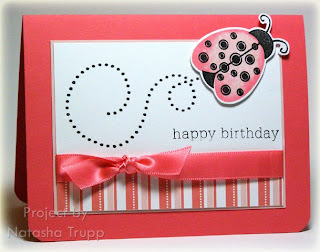 Here's another fun card using Flourishes latest release, Menswear. 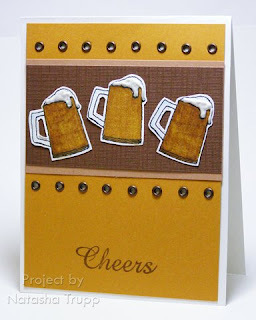 This time I wanted my card's focus to be on the beer steins. I coloured them in, cut them out, then added some liquid pearls as the frothy head of the beer. I mounted all that on some mustard paper that I had previously shimmered up with gold shimmer spray. I added LOADS of eyelets, and the Cheers sentiment to finish it up nicely. Carte Postale and the matching paper Porcelain Prints are such beautiful products, but I just never use them. I think I bought them closer to the end of mini they were first showcased in. It's funny, when a set is really popular, you get all excited to buy it and try all these amazing things you've seen with it. Except, for me, what end up happening is the opposite. The more cool things I see with a set, the LESS likely I am to use it. It's seems if I've already seen most of it's potential, why bother doing anything with it? So it's really good for me to go back to those sets that were really everywhere when they first came out, and approach them with a fresh attitude. It's kind of like going back to listen to that song that was played on the radio too much. You got tired of it then, but after a break, it's back on your playlist again. Anyway, here's the card! I stamped the leaves several times on some white paper. 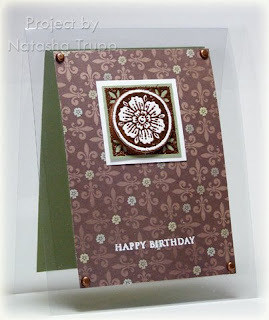 I stamped the medallion flower, and the smaller flowers onto Pale Plum paper with Perfect Plum ink. I coloured in bits of the flowers, cut them out and arranged them on the leafy background. 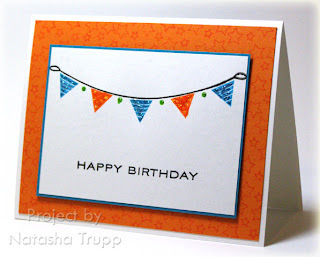 I love using striped paper in this type of layout, so this one from Porcelain Prints was ideal. I added a Verve Visual greeting, some ribbon, and some copper brads, and I was back in love with this set! The second card I made with this set is much better appreciated in person. It uses Flourishes heavyweight transparencies as a base. I used the Porcelain Prints paper once again as well as the medallion floral image. I embossed that with copper on moss, as well as white. 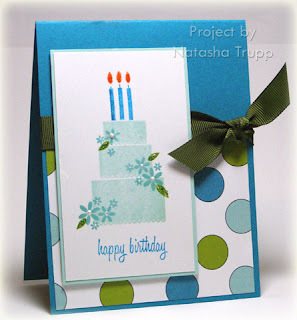 The greeting is from a PaperTrey Ink set, and was embossed in white. Stamps: Carte Postale, Happy Thoughts, Borders & Corners- monogram ed.